ProAction Networks is the United Kingdom's leading support vendor for the NEC 2000 IPS, Univerge SV8100 and SV9100, Univerge SV8300 and 9300, and Univerge SV8500 and 9500 business telephone systems. This includes the NEC IPS DM branch telephone system, NEC's Netlink, IP Trunking and CCIS mesh networking and the accompanying Zeacom Communications Centre application server. Based in Milton Keynes, Buckinghamshire and supporting, maintaining and serving 2000 IPS, SV8100, SV9100, SV8300, SV9300, SV8500 and SV9500 owners, administrators and users worldwide, ProAction Networks provide both ad-hoc support services and 24 hour, 365-day contractual support, warranty and maintenance. ProAction Networks, as a Cisco Certified Organisation with over a decade hands-on experience with the NEC NEAX and Univerge solutions and we can also perform complete rebuild, restore and clean installation services for the NEC NEAX and Univerge solutions and Zeacom Server. Despite it's age, ProAction Networks firmly believe the NEC 2000 IPS - latterly the NEAX 7400 IVS remains one of the most stable and efficient business telephony solutions available to medium-sized organisations and businesses today. ProAction Networks can optimise your NEC and Zeacom installation to ensure it performs 100% of the time. ProAction Networks are fully certified as an NEC Partner, Cisco Select Partner and Microsoft Partner and can apply a wide range of experience in IT support and Project Management to any given task. Recently, ProAction Networks have installed and supported the newer NEC SV8100 Business Telephone System, with it's new range of DT-series handsets, application software and Zeacom UCC Package. In the last decade, ProAction have helped a wide variety of people, businesses and organisations optimise and streamline their NEC 2000 IPS telephone system and Zeacom Server, bringing reductions in downtime, reduce maintenance costs and improve performance. Our long relationship with the NEC 2000 IPS has enabled us to optimise it’s Zeacom call centre, auto attendant, IVR, Voice Over IP (VoIP), Unified Messaging, Voicemail and CTI functionality for a wide variety of customers including those in the UK, USA, Australia and the Far East. ProAction Networks have a range of referees and case studies available online, as well as a free online forum and support portal based here. ProAction Networks realises that business today demand efficient, seamless communication - fully integrated with your data networks via CTI, Unified Messaging, Single Number Reach, VoIP, management, Call Centre and trunks. This convergence enables fast decision-making and improves customer responsiveness. The NEC UNIVERGE 360 range of telephony products helps small and medium sized businesses succeed at this accelerated level by placing people at the center of communications. At the heart of NEC's range of telecommunications solutions is the SV8100 - a smart voice solution for 2010 - and a smart upgrade from the NEC IPS 2000 or NEC Apire systems. The NEC Univerge SV8100 Communications Server is an integral part of this initiative. The NEC SV8100 Communications Server is the ideal system for small and medium businesses which need to compete and grow their businesses over time. With this system at the heart of your voice systems, and ProAction Networks providing you with 24-hour support and business-continuity, you will have the best solution at your fingertips for fast growth and great service! This robust, feature-rich solution is hugely scalable and can be expanded to meet your communications needs now and in the future. 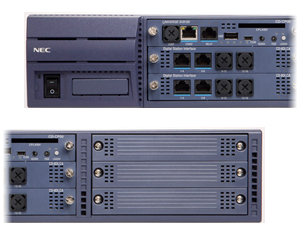 The NEC SV8100 is designed to be both versatile and scalable for your growing business needs. The NEC SV8100 supports TDM, IP, video, wired or wireless. It also provides three on-board applications and a full range of high-powered features that can be transparently shared between branches or remote locations. Individuals, departments and locations can work more efficiently by using this feature to communicate seamlessly in real time. NEC UNIVERGE SV8100 Desktop Suite - a significant component of NEC’s approach to help companies unify their business communications. For use on the SV8100 Communications Server, it combines the functionality of three products, PC Assistant, PC Attendant and the SP310 Softphone. With the Desktop Suite, your company can provide customers the attention they deserve. It can increase employee collaboration and provide the enhanced productivity needed in today’s increasingly mobile world. NEC UNIVERGE SV8100 Mobile Extension - For organizations to thrive, they must be flexible. Customers have come to expect full service from their retailers, care providers, hospitality services and educational institutions 24 hours a day, 7 days a week. Now NEC can ensure you have the tools to stay competitive – wherever you are– with UNIVERGE SV8100 Mobile Extension. Mobile Extension gives you access to all of the features of your desktop phone from nearly any external communications device. It enables you to use a mobile phone, home phone or other external device to simulate an extension of your office phone. And customers never know you’re not at the office! One number access lets them reach you wherever you are. UC for Business - Imagine having a business communication system that accelerates business processes and provides a flexible, scalable solution for employees. Unified Communications enables customers to experience greater productivity through the convergence of communication channels and business processes by using a combination of technologies, devices and services. Communications tools like presence, status, mobility, collaboration, video and voice conferencing, and messaging can all be utilized. Increased customer satisfaction – provides customers with a single number to reach their contact on the first try; positively impacting customer service dramatically. The SV8100 IVR resides on an internal blade equipped with the IVR compact flash. This flash drive enables you to easily download specific IVR script templates for turnkey installation. Appointment Reminder, Customer Information Inquiry, Employee Timesheet and Sales Order Entry templates are available for download to IVR users at no cost. NEC UNIVERGE SV8100 Multimedia Conference Bridge - provides small, medium and expanding businesses a flexible, in-house conferencing solution that protects their communications investment while providing PC-accessible features, networking options and excellent voice quality. This important component of NEC’s UNIVERGE 360 approach enables businesses to leverage technology to meet the needs of their employees and customers. NEC UNIVERGE SV8100 Automatic Call Distribution (ACD) facilitates the handling of high call volume with a minimum number of resources. It reduces caller hold time and distributes call volume evenly among employees. Callers are given the option of either immediately leaving a message for agent callback or holding for an agent. Those who wish to hold hear initial and repeating announcements encouraging them to remain in the call queue. This prevents callers from hanging-up and reduces lost calls thereby helping to improve employee efficiency and streamline staffing. The PC-Based Supervisor with Reports feature can be used for agent scheduling, business analysis and improvement of scheduling efficiency. The reporting package features an easy-to-use PC interface for compiling, analyzing and managing information. This convergence of technology and communication positions the SV8100 ACD as a key element of NEC’s UNIVERGE 360 approach. NEC UNIVERGE VM8100 InMail Solution - For today’s small-to-medium size businesses (SMB), there is simply no place for long call-holding periods, incorrect call routing or lost messages. While organizations seek the right solution to address these issues, they also expect improved efficiency, economy and convenience. The UNIVERGE® VM8000 InMail Solution, a part of NEC’s UNIVERGE360 approach to fully integrate communications into the business environment, is ideal for SMBs wishing to ensure that all callers get to the people and information that they need without prohibitive hold times or dropped calls. It is an embedded solution for the UNIVERGE SV8100 Communication Server that provides digitally-integrated voice messaging capabilities and Automated Attendant features to meet a SMB’s communication needs both now and in the future. NEC UNIVERGE UM8100-Mail Solution - For today’s small-to-medium size businesses (SMB), there is simply no place for long call-holding periods, incorrect call routing or lost messages. While organizations seek the right solution to address these issues, they also expect improved efficiency, economy and convenience. The UNIVERGE® VM8000 InMail Solution, a part of NEC’s UNIVERGE360 approach to fully integrate communications into the business environment, is ideal for SMBs wishing to ensure that all callers get to the people and information that they need without prohibitive hold times or dropped calls. It is an embedded solution for the UNIVERGE SV8100 Communication Server that provides digitally-integrated voice messaging capabilities and Automated Attendant features to meet a SMB’s communication needs both now and in the future. NEC UNIVERGE SV8100 Hospitality Management Solution - The UNIVERGE® SV8000 Series Hospitality Management solution for both the UNIVERGE SV8100 and SV8300 Communications Servers allows specific applications to integrate with business processes based on specialized roles within an organization. These role-enabled communications are a core component of NEC’s UNIVERGE360 approach. It provides advanced services to ensure your guests have a memorable stay. They can access the latest messaging services, and your business benefits from extensive features including flexible numbering, room status and toll-restriction check-in mode. Hospitality Management even works with your Property Management System (PMS) through Property Management System Integration (PMSI) to support many key front and back-office functions. NEC UNIVERGE SV8100 Communication Analyst - A part of NEC’s UNIVERGE360 approach, UNIVERGE SV8000 Series Communications Analyst is an easy-to-use, graphically-oriented software package that captures, monitors, and analyzes phone calls and trunk usage for single or multiple locations. It provides a clear picture of voice and network activity on converged communication platforms such as VoIP, hosted PBXs and hybrid telephone systems. For both SMB and enterprise organizations, Communications Analyst enables productivity measurement, cost management, toll fraud monitoring and billing creation. Because it is a scalable solution, with uncomplicated licensing and upgrades that are simple to implement, it can grow as your business grows. Its enterprise-level database standards ensure that your company will never outgrow it. Data can be centralized from multiple phone systems and locations with simple, easy reporting across the network. Communications Analyst seamlessly integrates with NEC’s E911 Security Notification to provide comprehensive reporting of 911 calls. It also integrates easily with most PMS systems. Those in the hospitality industry will find its customer billing features especially useful. NEC UNIVERGE SV8100 E911 Security Notification - To keep people safe and secure during an emergency, it is important for businesses to have a 999 Emergency Response system that can accurately pinpoint a caller’s location and direct appropriate emergency response resources to the scene. With the UNIVERGE SV8000 Series E911 Security Notification (ESN) application for the UNIVERGE SV8100 Communications Server, businesses will have the tools necessary to protect their most valuable asset – their people. NEC UNIVERGE SV8100 Voice Security Recorder (VSR) - NEC’s Voice Security Recorder (VSR) solution provides a total solution to call recording, documentation and agent evaluation. VSR provides a way to improve your company’s level of service and increase your Return on Investment (ROI) through the information it provides. The VSR solution is comprised of the VSR Unit, the 4-Port Digital Call Logging Unit, and two pieces of software –VSR Manager and VSR Reporter Pro. Together, these solutions offer a comprehensive call recording and agent evaluation package for businesses both large and small. As an added benefit, Voice Security Recorder integrates with NEC’s SonicView IP Recording to capture information from both TDM and IP transport technologies. This produces a single, comprehensive storage, reporting and management system for all recorded calls whether they are TDM or IP. Additionally, Agent and Supervisor Consoles provide further means to customize the application to fit your call recording and storage needs. SonicView IP Recording also integrates with NEC’s Voice Security Recorder to capture information from both IP and TDM transport technologies. This produces a single, comprehensive storage, reporting and management system for all recorded calls whether they are IP or TDM. NEC UNIVERGE SV8100 Digital DECT Terminals combine the benefits of digital telephony with the superior quality and features of DECT technology as an element of NEC’s UNIVERGE360 framework. These terminals help unify business communications by adding mobility options to your infrastructure. With the addition of the DTL-RPT-1 repeater, the coverage area of your UNIVERGE Digital DECT telephone system is extended in all directions – including up and down. If the repeaters are installed so their coverage area overlaps the coverage area of the base, the base can hand-off calls to the repeaters as the user moves from one coverage area to another. When connected to the repeater, the mobile handset operates exactly as it does when connected to the base. Hand-off from the base to the repeater is imperceptible to the user, even during an active call. This wireless system provides perfect voice quality, seamless handover and a secure air interface that protects your company’s investments in existing telephones, applications and your network infrastructure. NEC UNIVERGE SV8100 IP DECT Terminals - NEC’s Business Mobility provides a more flexible work environment by delivering on-site wireless telephony through the superior quality of the well established Digital Enhanced Cordless Telephone (DECT) technology with all of the benefits of IP technology. Business Mobility extends the reach of your voice communications by using your converged network to offer feature transparency between the wired and wireless world without any compromise in voice quality, availability and security. NEC UNIVERGE SV8100 Desktop Digital Terminals - In today’s intensely competitive business environment, smart companies know that it takes great customer service to get ahead. UNIVERGE Desktop Digital Terminals offer features and benefits that brilliantly capture the essence of form and function while providing businesses the means to seamlessly communicate with their customers. These terminals, which are an important part of NEC’s UNIVERGE360 approach, deliver exceptional value and can be customized to fit your organization’s needs. With their user-friendly ergonomic design, a range of models to choose from and a choice of interfaces and options, they provide users with access to the full power of UNIVERGE communication platforms. NEC UNIVERGE SV8100 Desktop IP Terminals - NEC’s UNIVERGE Desktop IP Terminals provide all the features and functionality of traditional phones with the seamless integration of advanced IP applications. Integration of voice and data is no longer limited to the network or the PC desktop; it is now in the end-users’ hands, providing role-enabled communications as part of NEC's UNIVERGE360 approach. UNIVERGE Desktop IP Terminals are ergonomically designed for natural comfort and facilitate use through an array of menu-driven soft key functions and easy-access function keys. Together, these aspects of the terminal deliver power, versatility and programmability to all user stations, maximizing efficiency and productivity. Because the entire desktop surface is crafted for user productivity and fosters better speed, service and performance, the UNIVERGE Desktop IP Terminal can help your business reach more profitable heights. NEC UNIVERGE MH240 Multiline Mobile Handset significantly improves user accessibility, productivity and responsiveness by providing workers the ability to roam from one business area to another – without losing productivity. The MH240 enables you to get the most from your NEC IP communication platform – even with a highly mobile staff. It provides all of the features that users expect from a desktop phone in an easy-to-use mobile handset with excellent voice quality, an intuitive LCD screen and simple menu-driven navigation. It even offers a wide range of features, such as a personal phonebook, courtesy mode, redial, and an integrated speakerphone. The MH240 works with NEC's UNIVERGE WL1500/1700 Series Access Points to offer a simple means of deployment and easy wireless network scalability for your growing business. The MH240 is part of UNIVERGE Assured Mobility™, NEC’s newest generation wireless LAN communications solutions. NEC UNIVERGE SV8000 PC Pro/WebPro - UNIVERGE® SV8000 Series PC Pro/WebPro is an instrumental troubleshooting tool that empowers users to manage their own terminals and provides them with the functionality needed to simplify communications. PC Pro/WebPro is a part of NEC’s UNIVERGE360 approach to integrating communications technology into the business environment. Most PC Pro/WebPro programming is done via three views – Standard, Wizard and System Data. These views are accessible through menu items, a tabbed view or one-click icons. NEC UNIVERGE SV8100 Netlink - For an organization to have true role-enabled communications, it must have access to the best data networking products on the market today. NEC’s UNIVERGE360 approach to communications ensures that we understand these needs and know the necessity of having comprehensive, integrated communications. Through this methodology, we place users and their specific roles at the center of our product development. NEC’s UNIVERGE SV8100 Netlink facilitates real communication integration and supports unified communications for your organization. It demonstrates NEC’s commitment to our UNIVERGE360 approach. Netlink ensures your business can grow and communicate effectively with centralized programming and management. It extends your reach to remote offices and mobile workers while providing increased efficiency, and feature transparency – regardless of the primary unit’s physical location. And because it is compatible with standards-based IP routing and switching, it even can be implemented on existing networks. ProAction Networks offer 2 types of NEC & Zeacom support contract. Our 'traditional' contract is similar to that of most telephone companies. It is based on 12% of the original cost of the hardware. This contract is sold in 6-month segments with no minimum term to limit your exposure and assure you, the customer that we are serious about keeping you happy. If we do not perform, you do not have to remain a customer! Within that 12% annual cost, you get a full warranty on all audited equipment. Should you experience a malfunction or some equipment fails, we will deliver, replace and reprogram - free of charge. We carry all equipment in stock and available immediately. Alongside the warranty, we provide 24 hour, 365 day-a-year support. Your account manager is your engineer and you will have constant direct access to him or her via email, mobile and support desk. Alternatively, we offer a ‘Per Seat’ maintenance contract. Many NEC 2000 IPS and Zeacom owners invested heavily in their systems many years ago, and in many cases their staff and premises have changed along the way. We do not insist you pay to maintain the 50% of a system which is not in use! You may have a system that is architectually over-powered but is still worth utilising and maintaining. For this reason, we offer this ‘per-seat maintenance contact. You get to choose which contract is right for you - which may simply be whichever is cheapest! ProAction Networks take pride in ensuring our customer base is overwhelmingly happy with the service they receive. Once a healthy, long relationship has been achieved we ask customers to give an honest opinion about their experiences with our company. We try to include references most appropriate to the proposal. More are available upon request and generally all are able to provide a specific personal reference upon request. Talent2 are a global human resources company. In London they have a busy office with an NEC 2000 IPS telephone system and approximately 50 end users on location. ProAction Networks have provided Talent2 with 24 hour support since 2007. Their previous maintainer was NEC-Philips. "Our existing support company just weren't providing the service we needed. We chose ProAction Networks because they quickly understood our problems - and solved them! They were able to give us confidence back with our telecommunication systems and at a much more competitive price. ProAction Networks have been available immediately whenever we had a problem, or just needed a bit of advice to make the most from our system." Sequel are specialists in London Market insurance, reinsurance and broking software. They have a large office situated in the City of London with approximately 150 end users. They utilise an NEC 2000 IPS DM telephone system and Zeacom unified messaging server. The majority of the NEC handsets are VoIP, but they also use a small mix of analogue, digital and conference endpoints. They also use Office Communications Server which will soon be integrated with the NEC 2000 IPS. “Sequel are the London Market insurance, reinsurance and broking software specialists and place a high value on maintaining open and clear communication with our customers. Whilst researching alternative support for our NEC 2000 IPS and Zeacom server, ProAction Networks were highly recommended. After some careful research, a meeting with Alex and a strong support proposal, we decided to offer the contract to ProAction Networks. I am pleased to say that the recommendation has been well-founded and ProAction Networks have provided a seamless transition to a better outsourced support solution. Their response times are great, their knowledge of the systems is excellent, and perhaps most importantly, they have familiarised themselves with our systems and our requirements extremely quickly as well as forging a good relationship between their staff and ours. We especially enjoy being able to get in-touch with very experienced engineering resource straight away. Quru deliver the best in class business systems. Quru was formed in 2007 from an in-house team that developed an award winning ERP system for a global SME. Quru are based in Somerset House on the embankment in central London. ProAction Networks provided Quru with an open source, IP-based PBX called Asterisk. The solution included 25 Cisco VoIP handsets, running native Cisco software for maximum usability. The system is entirely VoIP with all calls routed via SIP trunks. "Proaction Networks provides us with SIP trunks and cost effective call plans billed on a quarterly basis but their service goes well beyond that: they set up our Asterisk PBX, supplied us with various pieces of hardware and have the insight to tell us how to fix the most nefarious of Asterisk problems. It would be hard to find better value for money in the telecommunications industry." Motorbodies are the largest independent Vauxhall dealers in Luton – the home of Vauxhall. Motorbodies operate over two separate geographical locations in the town and utilise the NEC 2000 IPS (working as a true Distributed System) and Zeacom Communications Centre, installed by ProAction Networks to provide a complete, centralised telephone solution. This solution includes VoIP between sites, Unified Messaging, inbound Agent Contact Centre, Computer-Telephony Integration (CTI), Call Logging and DECT. ProAction Networks also provide Motorbodies with a high speed fibre optic link between the two sites and assist with ongoing Cisco Network management. "Motorbodies have always strived to maintain a forward-thinking attitude and ProAction Networks have been hugely influential in helping us successfully embrace a wide range of communications which has pushed our service forward exponentially. The service and support we receive is second-to-none and feel we really benefit by using a smaller, more specialised company over a large one with complex hierarchy and too much red tape. We are always impressed with the speediness in problem-resolution and the many ways in which ProAction Networks pre-empt many situations before they even become a problem." Many more references can be found at our main company website. Most telephone support companies sell a variety of systems and use a “cookie cut” support contract for all customers on all systems in all sizes. This approach is far from perfect. People who own and operate NEC 2000 IPS telephone systems are big enough to deal with the 'little issues' by themselves. Small businesses with small telephone systems often cannot afford dedicated IT and telephony support staff - they rely on their System Maintainer to solve a lot of the day to day issues. This hogs support resources and has an impact on all the other supported customers. Most NEC 2000 IPS customers ring infrequently - but when they do they need immediate assistance. ProAction Networks only work with a select few, slightly larger companies - which tend to own NEC 2000 IPS and Zeacom systems and need a support company which really knows it's stuff - the second the phone rings! The NEC IPS owner only tends to ring when it’s very very important! For this reason, we don’t employ a call centre - our customers tend to need third line support the first time they call!